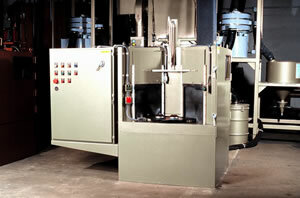 Sandblasting Components – Great Lakes Finishing Equipment, Inc. In addition to sand media blasters, sandblasting equipment like shot blasters, grit blasters, bead blasters, shot peening equipment and soda blasting equipment can use ceramic, metallic, glass or other particles of varying shapes to treat surfaces. Those surface treatment tasks include coating removal, smoothing or roughening, etching, carving, degreasing, deburring, deflashing and descaling. Such treatments are applied to all manner of metal, wood, glass and plastic products, and each different process requires variations in machinery, blasting technique and blasting media. Two sandblaster configurations account for all of the sandblasting processes in existence: compressed air and pressurized water. The surfaces and products that sandblasting equipment treat can be as small as nuts and bolts or as large as ship hulls. 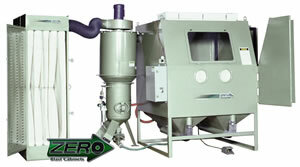 To accommodate this range of products, an equally wide range of blasting equipment is necessary. Automated blasting systems and sandblast cabinets allow large scale treatment of small products while portable sand blasters, which can be taken from one work site to another, make single treatments of large surfaces possible. Two main varieties or sandblasters, dry and wet, are widely used in the surface treatment industry. Wet sandblasters blast surfaces with a combination of blasting media and pressurized water. Only a small minority of blasting projects use pressurized water compared to compressed air blasting projects. Pressurized water is used mostly for the treatment of surfaces that need to be cooled during blasting. Dry machines use air compressors to generate a powerful stream that propels abrasives against surfaces. Three dry blasting configurations, gravity-fed, pressure pot and siphon systems, are the most widely used blaster configurations. Each design involves an air compressor, abrasive particle supply and a nozzle to direct the blasting stream. In each of the three configurations, though, the relationship between the components is different. Gravity-fed systems use gravity to direct abrasive into the compressed air stream. Sandblast Equipment – Great Lakes Finishing Equipment, Inc. These systems work well for small projects, especially in portable blasters. Siphon systems function by passing the compressed air stream next to the unpressurized abrasive store. The change in pressure siphons abrasive into the stream of compressed air. The pressure pot system is identical to the siphon system except that its abrasive store is negatively pressurized to allow for a more efficient combination of air and abrasive. Both wet and dry machines are applied in automotive, marine, construction, agriculture, industrial cleaning and processing, aerospace, decorative design, woodworking and glassworking contexts. Industrial fasteners, engine components, tractors, watercraft, cars, aircraft, heat exchangers, bridges, building components and printed circuit boards all make use of sandblasting equipment for cleaning and refurbishment purposes. In each treatment context, sandblaster configuration is only one of several considerations to make in advance of treatment. Blasting media shape and composition have as much of an impact on treatment process as does blaster configuration. Most varieties of blast media fit into two main categories: angular or sharp-edged particulates and rounded beads. Angular materials are used for deburring, descaling, paint and coating stripping, surface texturing and cleaning. Rounded media may be used for these applications as well, but they can also be used in shot blasting and peening applications in which compressive residual stress is conferred upon a metal surface by repeated, intense collisions with shot; this stress strengthens the surface. Smooth, bead-shaped media are usually ceramic, glass or metal, though they are sometimes also made of other materials. Angular sandblast media can be made of flaked aluminum, carbides, ceramics, copper, glass, iron, gold, plastic, steel, wood, acrylics, baking soda, silica and even nut shells and fruit kernels. Because of the variability of effects produced by different media blasters and blast media, abrasive media treatment professionals should choose their equipment and materials carefully before beginning treatments. Sandblasting Equipment Sandblast equipment is machinery that is designed to treat a surface by blasting it with pressurized particles. Sandblasting has become the blanket term for all media blasting processes, though it technically refers only to media blasting processes that use sandblasters and silica blasting media.